"People are always asking who my dad is. Dede says I don't have a dad, that I'm an immaculate conception. That's a pretty big responsibility for a little kid." I get a fair amount of ribbing from my editors about my enthusiasm and admiration of Jodie Foster and her work. Having grown up with Foster as a Disney staple on TV, I have watched her develop from a child actor into an accomplished adult superstar, so it was paramount that I have a hand at reviewing her first outing as a director. "It's not so much what he knows, but what he understands." - Garth (David Hyde Pierce). As a child prodigy herself, it is not too much of a stretch to accept the subject matter of Jodie Foster's directorial debut. On screen since the age of three, Foster took her first job behind the camera at 25, a move many of her peers questioned the timing of, as she had just won her first Oscar® for her role in The Accused, and could have been cashing in on that success. The role of director came about after Joe Dante (Gremlins, The Howling) abandoned the project, and the nurturing atmosphere at Orion Pictures gave Foster her shot, knowing they had a bankable actor, and that they wouldn't be losing a lot if the project was a failure. Scott Frank's (Get Shorty, Dead Again) script had been around for over a decade, starting out as his film school final treatment, but was heavily revised for the final production. The story is told through the eyes of seven-year-old Fred Tate, whose mother, Dede (Foster), a waitress, recognizes that he is exceptionally bright at an early age. He is a gifted pianist, painter, poet, and also extremely advanced at mathematics. As a single parent, her son is the world to her, and she tries to supply him with an atmosphere that will challenge him. On the other hand, she worries that his cognitive maturity is manifesting itself with physical consequences, due to the stress he is putting himself under. Fred aspires to be just like his classmates, but stands out because of his overwhelming intellect and geeky awkwardness. Bored with school, he is in desperate need of stimulation in order to advance his many talents. Psychologist Jane Grierson (Dianne Wiest - Parenthood, Edward Scissorhands) is an author and runs a school for gifted children. Her scout (David Hyde Pierce - Frasier) locates candidates for the school, one of whom is young Fred Tate, and she extends an invitation for him to join a group of likewise gifted youngsters on a three week tour, where their abilities can be assessed. If successful, enrollment in Grierson's school could follow. Though hesitant to let her child go, his mother truly only wants what is best for him, but the tension between Dede and Jane over the child's future is set to boil from their first encounter. This film explores the isolation present in the world of a child prodigy, but its key focus is on the relationship between Fred and his emotionally rich, financially challenged mother, and the disciplined, academic world that Grierson offers. With the boy caught in the middle, his duty to perform to everyone's expectations begins a self-destructiveness that his level of maturity does not know how to deal with. His uniqueness, and constant longing for role models—and the disappointment they ultimately bring—are key factors in the development of this child, and as the story unfolds, Fred Tate has to come to terms with those he loves and who care for him. Newcomer Adam Hann-Byrd excels as Fred, in a consistent portrayal of a genius whose inner frailty has him reaching for the two mother figures in his life. Foster and Wiest also deliver fine performances, with Foster tackling the emotional side of the equation, and Wiest managing the more structured, yet often humorous role as a would-be matron. Fringe characters do not go to waste, with David Hyde Pierce, Harry Connick Jr. and Debi Mazar fleshing out the accessory parts well. While not without its flaws (particularly concerning special effects) , Little Man Tate does manage to avoid falling into many potential pitfalls that could easily have degraded the end result. For instance, there was plenty of opportunity to wallow in emotional sequences that were pleasantly absent, and the script's ability to handle both the crisis brewing in its three main characters while infusing a well chosen blend of dark humor, keeps the film moving. The resolution is satisfying, and the journey interesting and entertaining. A very fine directorial debut. Image Transfer Review: Presented in its 1.85:1 aspect ratio, the anamorphic transfer is free of many print defects. The image is fairly soft, and no edge enhancement is present. Colors seem accurately rendered, not overly saturated, though perhaps a bit on the dark side. Black levels look okay, but low level detail is lacking. A solid if not overly impressive result. Audio Transfer Review: Audio is clear with no distortion or other anomalies present. While this is a 5.1 mix, surround activity is sparse, with dialogue being the primary focus. As such, full frequency range is only utilized during the musical segments in the soundtrack, which feature primarily jazz. French and Spanish stereo surround tracks are also present. Extras Review: The centerpiece of the disc is the feature-length commentary by director and star, Jodie Foster. As is the case in every commentary I have heard of hers, she provides intelligent, honest and informative narrative about her role, both as director and star, and about the film's production. She is extremely candid about how she went about her job, what mistakes she made, and where her na�vet� played a part in the final product. Gaps are few and far between, and rather than give shot by shot descriptions as many comentators do, instead Foster digs into deeper philosophies behind her choices, and what did and didn't work. She also admits that she had a lot to learn during the course of production, but as is her style, she accepts responsibility for both the good and bad. A very worth while listen. We also get a full-frame trailer for the film. 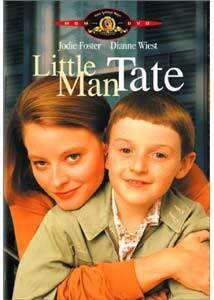 Little Man Tate is a wonderful, sensitive and funny film, and a solid first time directorial effort. The characterizations leave the viewer trying to determine whose ideas to support, without playing either side as the bad guy. All three primaries do excellent jobs in their roles. Though a little rough in spots, this is still highly enjoyable. The commentary alone is worth the price of admission.